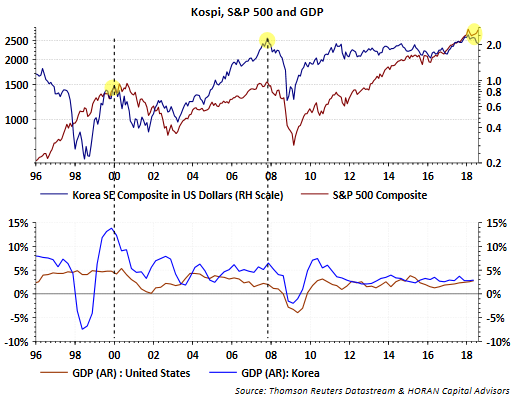 HORAN Capital Advisors Blog: Is Korea Equity Market Weakness A Precursor To Weakness In U.S. Markets? Is Korea Equity Market Weakness A Precursor To Weakness In U.S. Markets? 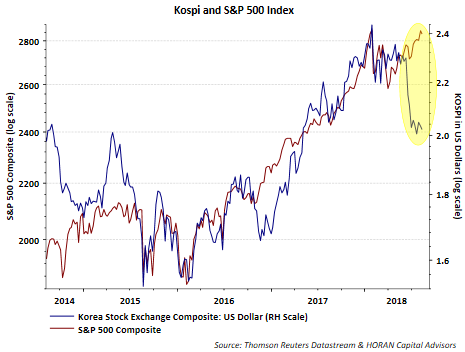 About a year ago I provided an update on the Korea Stock Exchange Index (KOSPI) and the fact it can serve as a leading indicator to U.S. equity market performance. As noted in that earlier post, I referenced noted economist, Ed Hyman of Evercore ISI, who believes the KOSPI index is a leading indicator of the global economy as South Korea's exports account for over 40% of the country's gross domestic product. In other words, the KOSPI Index performance is a reflection of the health of the global economy. Also worth noting is the largest sector weighting in the KOSPI index is the technology sector, accounting for over 40% of the index weight. The below chart compares the KOSPI index, in US Dollars, to the S&P 500 Index. Since early June the performance of the KOSPI Index has diverged to the downside versus the S&P 500 Index. Even with the KOSPI priced in Won a similar divergence is seen. Some of the weakness may be attributable to investors reducing emerging market positions in ETFs like the iShare MSCI Emerging Market Index (EEM) as Korea remains classified as an emerging market country and makes up about 14% of the index. China is the largest weighting at 32%. The EEM ETF has experienced outflows of nearly $5 billion since June 1. Last week though, EEM had inflows of about $178 million. Some of the weakness in the Korean market might be related to tariff issues. The Trump administrations comments about increasing tariffs on more Chinese exports is being felt in other Asian countries. However, economically, the Korean economy is continuing to expand, but higher tariffs could have a negative spillover impact on their economy.